So, remember the other day I said the husband had worked many extra hours last week and I thought he deserved a nice meal? Although, really, when doesn't he get a good meal? 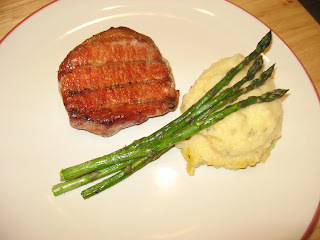 Anyway, we grilled pork chops, had roasted asparagus in the oven, and our new favorite baked mashed taters. I'm not sure why I haven't come up with this dish before, as it is so easy, and tastes so good. I think it was, I always had a problem with getting all the LUMPS out of my mashed potatoes. Anyone else have this problem? If so, I have the solution. Use your Kitchen Aid mixer, with the large whisk attachment. Works like a charm! It fluffs these babies up in no time. So far I've made this side dish twice, and no lumps have been found. Place cut up potatoes in a pot of water and bring to a boil. Cook until fork tender. Meanwhile mix all other ingredients and place in bottom of mixer. When potatoes are done, drain and put into mixer. Mix on medium speed until smooth. Transfer to a baking dish and bake in oven for 30 minutes, removing lid last 15 minutes to get a nice crunchy crust on top. Now, of course, there is no reason you have to put these in the oven. They are essentially done after you mix, but I love the crispy top it gets in the oven. Plus, you can do these up ahead of time, and just stick in the oven to reheat if you are waiting for something else (i.e. pork chops) to finish on the grill. These would also work to be reheated in the crock pot? What do you think? What is your favorite way to eat a potato? I'm not going to lie, a good crispy french fry is probably my favorite! Don't pretend you don't eat them. Great idea!! I have never used my mixer, but my mom uses a hand mixer sometimes. The kitchenaid is a fabulous idea! Never met a potato I didn't like! 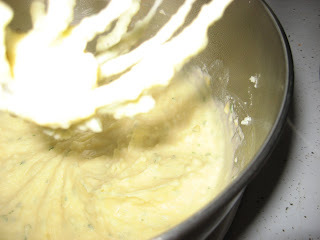 My mother used a potato masher and could really whip those taters till they were creamy but I use a hand mixer. I always have used a beater to mash potatoes. My mom did it, so I guess that's why I do too. French fries are my fav too...but really, I adore a simple boiled potato with butter or sour cream. I don't like lumps either - I use a potato rice - its less than $10 bucks and works when I don't want to lug my mixer upstairs. Looks delicious! Truth be told - I am a tater tot whore! If it's an option on a menu over fries, I am all over them! The potato is one of my weaknesses. I can't say no to them, no matter how they are prepared. Its like my taste buds do back flips the moment I stick em in my mouth. don't have 1 fave. they are all faves. I love french fries..but I'd have to say I could eat a dump truck of mashed potatoes!! As I was reading your post I was like "I wonder if she has a mixer..." That's what I use! My kitchen aid stand mixer with the whisk thingy. I crank it up to almost high and it makes them almost fluffy. SO GOOD! I also like adding a little cream cheese to mashed taters. Now you've got me craving them! French fries! Why would you ever pretend you dont eat them, they are heavenly!